Okay, I just had to sound off on this one... Like a tremendous mental-gimp, I've just sat through this film in its entirety. 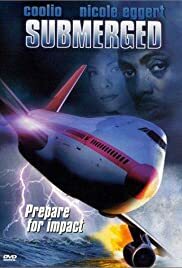 You'll note that the trivia section of IMDB points out that portions of the raising of the 747 were "borrowed" from Airport 1977. This really doesn't scratch the surface... Virtually all exterior shots of the plane skimming the ocean, landing in, sinking, and even the at-rest shots are borrowed from Airport '77. All of the "raising" shots are pulled from '77, including most of the interior flooding clips, with the exception of Dennis Weaver's drowning. I couldn't help but wonder if Olivia Dehavilland might come floating by at any moment, or maybe a "dead" Tom Sullivan. Another eye-roller: Dennis Weaver's name in this film is Stevens, which is to compensate for the fact that Airport '77's plane is owned by the Stevens Corporation (headed by Jimmie Stewart of course). This is a veritable calvalcade of actors who don't work much, or at least haven't worked in a while, which might have been the first clue that it was going to be a real stinker. I've rated this film a 2 - It's quite worthy of a "1", but if this film can't offer any other redeeming quality, at least somebody helped Coolio, Max Caulfield, Nicolle Eggert, and Dennis Weaver make their car payments that month!